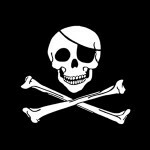 International Talk Like a Pirate Day website. In the true Caribbean manner it’s a twist on the Cuba Libre. Start with a shaker of ice, add the three rums, bitters, and vanilla. Shake, shake, shake Senora. Strain into a large Tiki mug filled with ice. Liquor should fill mug about half way. Fill with Coke, squeeze in juice of 1/4 lime, and two shakes of nutmeg, stir. Top with a little more nutmeg and lime wedge. Damned good grog! If you like it sweet, add a little pineapple juice to taste. Avast! And May Ye Enjoy The Captain’s Private Stock! While you’re in the Pirate Mood, you might want to check out the Living Like A Pirate website, a fun place to go for Pirate Life party ideas, threads, treasure and more. Real nice people over there, for Pirates. -Captain Tiki Chris reporting from the Lido Deck of the The Black Bird, the finest ship in the Pirate fleet.